One day in October 2010, in the Nashville Airport, I became MomGyver. Yes, I had a little help from Mr. Dyson, but he was merely a cog in my machine. Near the end of a three-hour layover on our way to California, we decided we better take Max (who was 8 years old) to the bathroom. Max is globally delayed and has apraxia and sensory processing disorder. Also, at that time, he couldn’t tell us when he needed to go. We’d been putting it off because it was often a fight. (So, really, everything that ensued was our fault.) But I got him to stand up and quickly realized he was soaked. He never has potty accidents… he usually holds it like a champ. We were stunned, and we didn’t have any extra clothes with us. I took him into the bathroom to get him cleaned up and plotted my next move. I washed him off and rinsed out his underwear with the hopes that I could find a pair of shorts or sweatpants in an airport shop in the next 15 minutes before we were supposed to board! Then I saw it. The Dyson hand dryer. If you’ve never used one of these, hunt one down. It’s an amazing piece of engineering. I’d used one before, so I knew the power and that it blows air from two sides. In a matter of five minutes, Max had dry underwear. I just stood there with Max, his shirt long enough to cover him up, and moved his little boxer briefs up and down in the dryer. I even got a couple of “so been there” looks from other women. OK, he was covered but his sweatpants were still wet. And we needed to board in 10 minutes. I delivered him to my husband, Cris, and ran to all the nearby stores, but not one had bottoms of any kind. They all had T-shirts and sweatshirts. We can’t possibly be the first family to have this happen! There was a pricy kids’ clothing store, but she only had up to size four. So I got in line with my guys, feeling slightly defeated. Cris just carried Max (who was the size of a 6-year-old) on the plane. If anyone noticed the lack of pants, they didn’t even give us a sideways glance. We get settled, and right after takeoff, Cris needed to use the restroom, I asked him to rinse the sweatpants so they wouldn’t smell. Then I realized that the middle seat in front of us was empty. Score! He returned with the wet pants, I hung them slightly over the seat and aimed all three of our air vents at them and flipped them half-way through the flight. We landed in San Diego three and a half hours later with dry pants. And it’s a good thing, too, because while Max and I waited at the end of the tube for Cris (who was getting the gate-checked stroller), Max channelled the Mayor of San Diego. He said “hi” to literally every person who came off that plane. Even groups of three, he’d shout “Hi! Hi! Hi!” And they all said “hi” back. I wish I had video of it… it was ridiculously priceless. But I seriously doubt anyone would’ve thought it was so cute if he’s been standing there sans pants! The Mighty is asking the following: Share a travel moment related to disability and/or disease that made you laugh, cry, roll your eyes or was otherwise unforgettable? If you’d like to participate, please send a blog post to [email protected] Please include a photo for the piece, a photo of yourself and 1-2 sentence bio. Check out our “Share Your Story” page for more about our submission guidelines. Michele Cohen is an editor and writer. She and husband, Cris, own a small social media company. 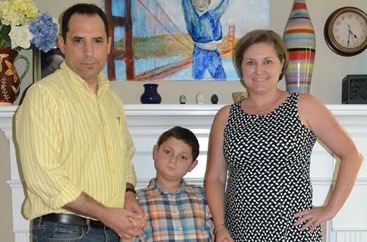 They are parents to 13-year-old Max, who is globally delayed and has apraxia, sensory processing disorder and various other special needs. They live in Cary, North Carolina.